No surprise that I am looking forward to a ride on the Empulse. Whether it happens when the Brammo Empulse Road Show comes through Kansas City (probably not going to happen, but one can dream) or when I visit my fellow member of the Society of Brammo Evangelists of the Year, Jeremy Dory, who just won an Empulse R, I intend to test out the real world accessibility of performance. I tend to think that Harley Davidson has the stars and stripes angle on motorcycle riding gear pretty wrapped up, so I told him that while I liked his creativity, I didn’t want to go with the “Old Glory” design. I did, however, appreciate what I thought was a subliminally suggestive figure of a female body under the sheets. Can anyone else see it, or am I just being a dirty old man? If you’re interested in working with Louie on your ideas for a custom painted helmet, he is extremely easy to work with and has a lot of creative energy to expend on these projects. He’s got a Facebook page: L B Customs or you can email him at lbcustoms2012@yahoo.com. I am deeply saddened to report that our colleague and good friend Mark Buckley has been killed on the final day of the North West 200. Mark, 35, was taking part in the third race of five on Saturday. Following the incident Mark was taken to hospital where he later died. Brammo staff are devastated by this news. Our thoughts and prayers are with his wife Jayne and we extend our deepest sympathies to his family and friends. 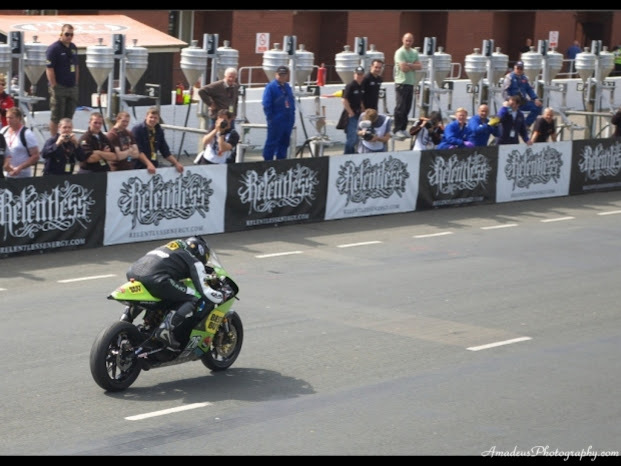 Mark rode the #26 Brammo Enertia TTR to 3rd place in the inaugural Isle of Man TT Zero Emissions race in 2009. Buckley was a great racer, and a decent human being. Recently, I had been chatting with him on Twitter and he had offered to have the shirt, above, (which was a gift to me from JCAM, Brammo’s Hong Kong distributor), autographed by Roy Richardson, the rider of the #11 Brammo bike in the 2009 TTXGP on the Isle of Man. Busted. He found me out – I’d been using a photo of him from the TTXGP as my emotorules twitter profile image for years. Mark, talking about the Brammo Enertia TTR. 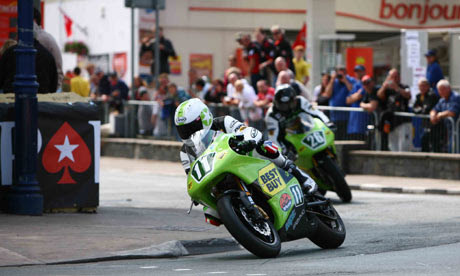 Riding past the fuel tanks that would not be necessary to propel him into 3rd place in the 2009 TTXGP. Buckley, on the #26 Brammo bike, coming up from behind the #11 bike, ridden by Roy Richardson. My thanks to you, Mr. Buckley, for the memories. My thoughts and wishes to your wife and family. Can’t make it to Los Angeles to watch the unveiling of the Brammo Empulse electric motorcycle? Or maybe you’re there but don’t have a thing to wear? Or didn’t score an invite? No worries. Tune in with the rest of us who will be watching it from the comfort or our mother’s basement, or living room, or internet cafe, etc. This is where you can watch the event unfold. Livestream has its own chat sidebar, but we’ll be keeping our eyes on the twitter stream that will be running hot, all night long. Want to see your witty suggestions about a 25 mile long extension cord or playing cards in the spokes show up on the page? Make sure to use the hashtags #Brammo #Empulse in your tweet. Not sure what a hashtag or tweet is? Go back to myspace.com and we’ll educate you, tomorrow. The REAL fans, however, will be dissecting everything over on the Brammo Owners Forum – http://brammoforum.com . Likely, we’ll be in the Brammo Empulse subforum. You don’t have to join to read the discussion, but you do have to join if you want to give your two cents. I’ll update this post if anything else especially relevant comes to mind. If you don’t hear from me here, you should know, by now, where to find me. I’ll be the one drooling over Empulse, of course. I know, you miss my rapier wit and my “how did he find that out” exclusive Brammo news. I miss you, too, dear reader. It’s just hard out there for a Brammofan. Most of the action, these days, occurs over on the Brammo Owners Forum which I run (with @skadamo’s invaluable assistance). I’m not shutting this blog down, it’s just that I’m acknowledging the fact that I spend an unhealthy amount of time on the forum. So come on over, join if you feel so inclined. You don’t NEED to be a Brammo Owner – but you might WANT to be after hanging around with us. Zeus seems to be angry – as if someone below has unlocked the key to the mystery behind his ability to control the lightning bolts he hurls. Someone has harnessed their power and is about to unleash it upon a world that is starved for energy. The Bull is ready to be released from its pen.